972-875-1234 M-F 8a. to 5p or Click Here . The City of Ennis Department of Health Services will conduct an investigation and pursue legal action if necessary to bring the property into compliance. You've spotted a rat on your property. What next? NOTE: For rodent control inside your home, contact a private licensed exterminator. To report code violations that are contributing to a rodent problem, such as tall weeds/grass, trash, or debris contact the City of Ennis Department of Health Services. The Department's staff will conduct an investigation and pursue enforcement action if necessary to bring the property into compliance. Tenants experiencing rodent problems in multi-family or commercial rental property are advised to contact the City of Ennis Department of Health Services. Landlords are required by the International Property Maintenance Code to maintain their rental property free from rodent or insect infestations. To report a problem, by contacting the Department at 972-875-1234 M-F 8a.m. to 5p.m. or Click Here. The City of Ennis Department of Health Services can assist you in controlling rats on the outside of your property and in your neighborhood. We send out staff to inspect your property, place a tamper resistent bait station in a rodent-attracting location outdoors and advise on how to help prevent rats. Rodents are a fact of life but we can reduce their numbers by working together. The success of the Departments program is dependent upon your cooperation. You can help keep rodents away from your home by depriving them of food and shelter. Keep your entire premises clean. Seal garbage in tightly covered metal or heavy rubberized containers; don't use containers like bags or boxes. All garbage should be bagged before it is placed in the sealed containers. Drain and wrap food waste before putting it into can. Keep cans at least 18 inches off the ground and keep can area clean. Store food and food contact items in rat-proof rooms and containers. Don't store food in the garage or outside. Clean up any spilled food immediately. Don't leave out uneaten pet food. Clean dog droppings up daily. Don't put bird seed on the ground; rodents will get it first. If you use a bird feeder, the area under and around it must be kept free of seeds and hulls. Seal cracks or breaks in your foundation and repair holes in floor around pipes, screen doors, windows, vents and other openings into your home to prevent rodents from entering. Outside steps should be made out of concrete/masonry. Keep the space beneath wooden steps clean. Rats and mice are responsible for the spread of a number of diseases, either directly, by contamination of food, or indirectly, by way of rodent fleas and mites. Rats continuously gnaw to keep the growth of their teeth in check and to gain entrance to obtain food and shelter. Rats destroy approximately ten times more food through urination and defecation then they actually eat. Additionally, numerous fires have been started by rats chewing through electrical wiring. The presence of live or dead rodents. Rodent nests. These can be made up of many kinds of materials, such as bits of paper, straw, rags, etc..
Rodent odor. A distinct odor from rodent urine may indicate the presence of rodents. Droppings. The presence of droppings can indicate activity and possible severity of the problem. Evidence of gnawing. Rodents gnaw in an attempt to obtain shelter and food, also to keep their front teeth, which grow constantly, from becoming too long. Rub marks. Deposits of body oil and dirt from rodents found along frequently traveled routes may be used as an indicator of habitual pathways. Runways. These are frequently traveled paths along floors, stairs, and shelves, where droppings, rub marks and stains from rodent urine are found. Tracks. Footprints indicate the presence of rodents and furnish information regarding places where they travel or which they frequent. Rat Burrows. Burrows consist of tunnels dug below ground and are used by rodents for nesting and as a path for travel. Rats are excellent swimmers, and can swim up to a half-mile in open water or travel through sewer lines against substantial currents, and can tread water for up to three days. Rats can climb effectively, jump up to three feet in the air from a standing position or drop from heights of up to 50 feet without injury. 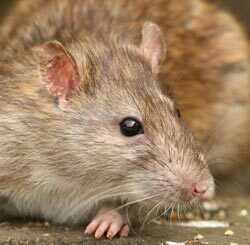 Rats can gnaw through a variety of materials, including lead sheeting, cinderblock, aluminum siding, glass and improperly cured concrete. Rats can squeeze through very small openings: as small as a ½ inch! Weather determines the activity of rodents. Mild weather means more breeding. A Norway rat can produce up to seven litters per year with up to twelve young per litter. Dry weather will cause storm drains and creeks to dry out, driving rodents to seek water in swimming pools, birdbaths and outdoor pet water bowls. Norway Rats, as well as other rats, prefer food with a high carbohydrate and protein content although almost any type of food will be taken, food items in household garbage provides rats with a balanced diet. Indoors, the Norway rat prefers to nest around the floors of buildings, but when populations are large, it will occupy attic areas, suspended ceilings and under floors. Outdoors, the nesting places are often in burrows alongside of foundation walls. Rat burrows start out usually short, varying between 12-30 inches in length. As the rats mature, begin to rear families, and the population grows, the burrows become enlarged and expanded. The territories of most rats are between 50 and 150 feet radius around the nest. If need be, however, rats will travel 1300 feet or more daily to obtain food and water. In urban areas most rats remain around the buildings and yards which provide their necessities, and unless they are disturbed, they do not move great distances. Rats constantly explore and re-explore their surroundings, but are wary of new foods, new objects, or changes in their environment. This is termed "neophobia" which means "a fear of new". This neophobic behavior may last for several hours or even for several days. Even a change in position of a familiar object causes suspicion. This is why traps and bait boxes are sometimes avoided for several days. essential elements of food, water, shelter and space) rats as they prefer to eat seeds and plant foods such as fresh vegetables or fruits. The roof rat is appropriately named because by nature it is a climber and commonly lives above the ground in "roof" or aerial areas around structures. Eliminate weeds from the exterior of buildings and maintain an uncluttered, weed-free perimeter of at least three feet around buildings. Trim any tree branches overhanging buildings, they can be used by rodents as a travel path into your home. Eliminate any outside debris, such as old equipment, boards, pipes, or wood piles that rodents can use for hiding or nesting. When storing wood or other materials, ensure that they are elevated at least 6 inches above the ground. Consider sources of available water, such as ditches, stagnant pools, decorative fountains, and ponds. These are essential elements of a rodent's environment. The most effective and permanent rodent control is to keep rodents out of buildings. Doors, windows, screens, and cracked concrete are all areas where rodents can gain easy access. Be aware of openings near the top of buildings as well. Roof vents, eaves, attic vents, overhangs, and roof top air conditioning units provide access to wall voids and other areas in a structure. Down spouts need a screen on the bottom as well as the top. A successful rodent control program will combine the elements of baiting and trapping to achieve the highest rate of success. With any rodenticide, bait acceptance is the key to good control. Inert ingredients must appeal to a rodent's sense of taste and desire to gnaw. Start your baiting program by determining the severity of the infestation. Keep in mind that if rodents (particularly rats) are seen in the daylight then the problem could be quite severe. Set up a perimeter baiting program using tamper resistant bait stations. Place stations every 30 to 50 feet around the perimeter of the building. Maintain a fresh, uninterrupted supply of bait. Use a versatile bait station (one that can be re-located ) along walls, in corners, under pallets, appliances, and other tight areas. People and wildlife might shake bait out of the bait station. Rodents can move or kick bait into the station entryways, making it accessible to a reaching hand or a pet's paw. Rodents can move the bait to their nest or other areas. Secured bait provides added bait protection in sensitive areas, such as around children or pets. Secured and elevated bait remains free of moisture that can collect on the floor of the bait station, thus prolonging it's useful life. Non-poisonous Trapper Glue Boards are a useful tool for monitoring and capturing rodents. The effective use of glue boards depends primarily on the correct placement of the boards. Identify rodent runways and harborage, place the boards directly in the runway, flush against the wall between the rodents harborage and feeding areas. The house mouse is identified by a small slender body. The ears are large, the tail is semi-naked and is as long as the head and body together. The potential reproductive capabilities of rodents are impressive, a female produces 4 to 7 pups per litter with a gestation period of about 19 days. If conditions are good, she is capable of giving birth every 24 - 28 days. The Norway Rat has a stocky body. The tail is not quite as long as the body and head together. Norway rats weigh between 12 and 16 ounces. This species is larger, stronger, more aggressive, and better adapted for producing young and surviving in colder climates then the roof rat. Roof rats are smaller and sleeker in appearance then the Norway rat. Their ears are larger, and their nose comes to a more pronounced point . Whereas Norway rats live in burrows or under floors, Roof rats prefer to live in areas elevated above the ground. Theoretically, one female rat could have from 3 to 6 litters of 6 - 10 offspring per year. In other words, one adult female could be responsible for 320 million descendent within a period of three years.